Young people can accomplish whatever they put their heart to, including running for public office, a Nevada legislator said Wednesday at a panel at the Democratic National Committee’s Hispanic Caucus. PHILADELPHIA — Young people can accomplish whatever they put their heart to, including running for public office, a Nevada legislator said Wednesday at a panel at the Democratic National Committee’s Hispanic Caucus. 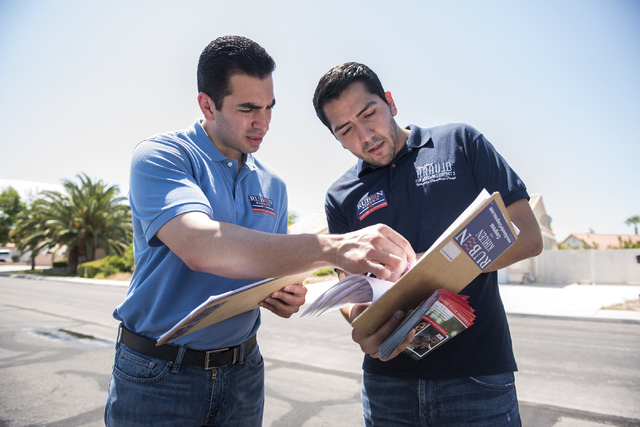 Assemblyman Nelson Araujo, a 28-year-old legislator, has life experience to back that up. He’s the youngest member of the Nevada Assembly and was elected to his first term in 2014, shortly after turning 27. Araujo, D-Las Vegas, spoke on a five-member panel about how to reach out to young Latinos to involve them in the political process and get them running for office. The panel also featured Julissa Arce, a former Wall Street executive; Felix Ortiz, chief executive officer of a technology and education company; Javier Palomarez, president and chief executive officer of the U.S. Hispanic Chamber of Commerce; and Los Angeles Mayor Eric Garcetti. Araujo was born in Las Vegas. His parents left their native El Salvador in the 1980s when that country was in a civil war. He praised his mother, who has worked for decades as a hotel housekeeper. When he first ran for office at age 26, some people told him he was too young. Young people will get involved when they realize people have overcome much to succeed, he said, adding it’s also important to connect with young people in a way that they communicate, such as through social media. People sometimes say millennials — the generation born in the 1980s and 1990s — don’t pay attention. But Araujo said they do, with their cellphones. “We should get into the new ways of doing things and learn how to better communicate with our millennials,” he said. Contact Ben Botkin at bbotkin@reviewjournal.com. Find @BenBotkin1 on Twitter.